The official Focus Camera eBay Store is offering the Beyerdynamic DT 880 Premium Limited Edition All Black Over-Ear Headphones for $135 shipped. That’s more than $160 below the original listing, $40+ under Amazon and the best we can find. 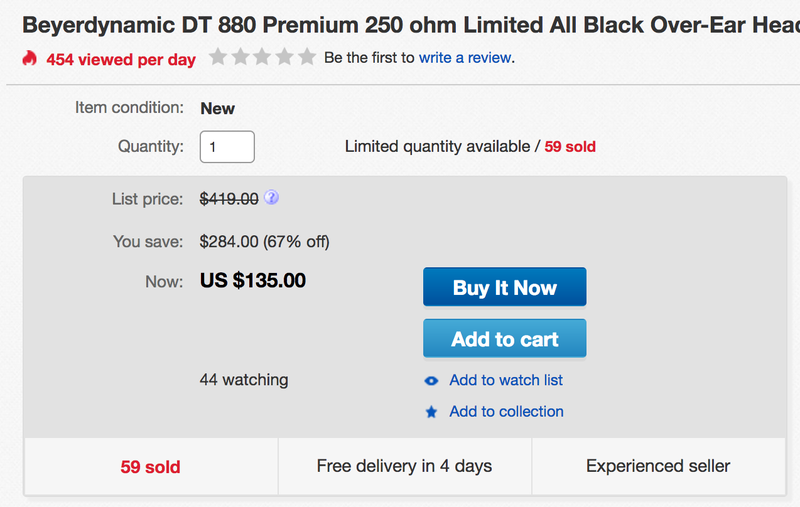 Today’s deal is lower than any DT 880 model we can find (limited or not) and is even better value than the bundle deals available on Amazon right now. The DT 880 Beyers have received 4+ star ratings from hundreds on Amazon. Details below. Our Semi Open back ear cups are ported and lined with an acoustic baffling to retain some of the acoustic energy. We are know for making some of the best closed and open back headphones in the world. The DT 880 possesses the best qualities of both. The balanced reduction of environmental noise guarantees a perfect spherical sound, while the complete sound spectrum is reproduced in great detail from the lowest sub bass up to the highest frequencies. The higher frequencies are crystal-clear without being unpleasant and impress with a very smooth sound. The precise balanced mid frequencies are analytical and supportive, without being predominate. The bass is voluminous without being too obtrusive. The Made in Germany quality promise applies to product development and manufacture: the designs of beyerdynamic engineers and designers in Heilbronn are then built by approximately 180 highly qualified employees in Germany – mostly by hand.